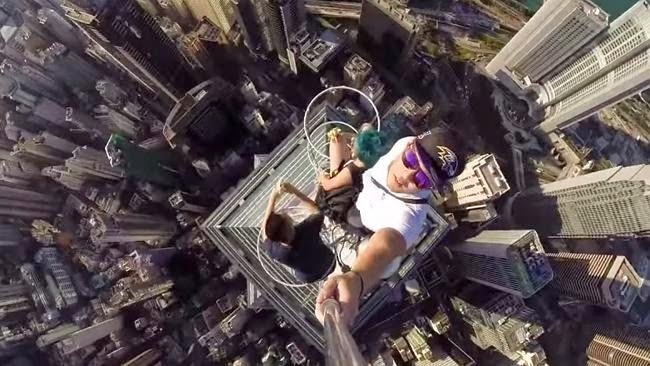 Hong Kong: Three teenagers decided to take their search for a thrilling selfie to new heights. Perched on the top of The Centre (at 1,135 foot high) —Hong Kong’s fifth tallest skyscraper — Daniel Lau, joined by his two friends, stands up without any safety harnesses and stretches out his smartphone on a selfie stick to take a video that’ll make you weak at the knees with vertigo. Lau, and friends Andrew Tso and a girl identified as A.S, are seen snacking on bananas the start of the video while perched dangerously on the spire of Hong Kong's fifth-tallest skyscraper. As the camera extends the height the friends have scaled becomes terrifyingly clear, with incredible views of Hong Kong's streets below. Tso is no stanger to heights having spent three years travelling the world in a bid to find new and exciting views from atop giant buildings. Many viewers of the video, which is being called the “world’s scariest selfie,” have commented the footage made them sweat or made them feel sick. While selfies have become part of our daily lexicon, they’ve also become increasingly dangerous as people try to capture themselves in memorable moments. In April, a Regina man was kicked in the head by a train conductor in Peru while taking one too close to a moving train. A man was also attacked by a squirrel in April after taking one with the furry creature, who appeared friendly before turning on him. And at the Tour de France in July many fans put themselves in danger trying to get selfies in front of the riders on the course.